More than 600 students, faculty, staff and alumni of Tusculum University fanned out into the region on Wednesday to provide a day of service through helping others and improving the community. 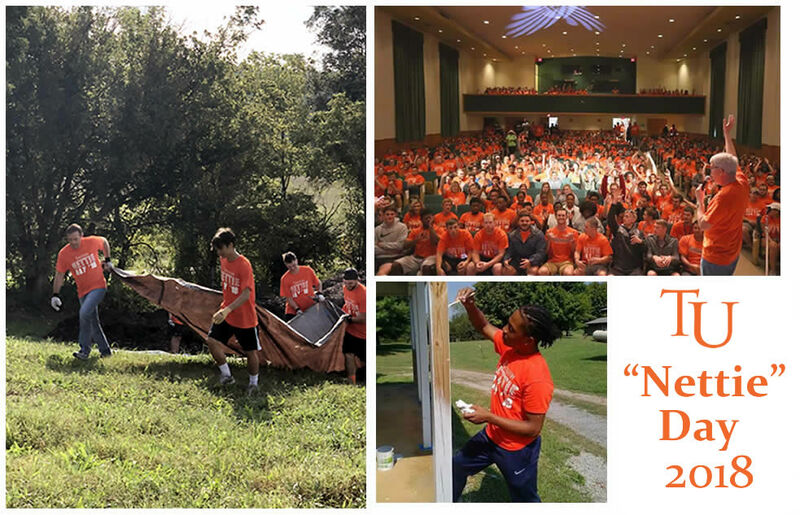 All freshmen and first-year transfer students participated in Nettie Fowler McCormick Service Day as part of the Tusculum Experience course. Many other students, faculty, staff and alumni also pitched in totaling 605 participants working at 23 locations, according to Dr. Ronda Gentry, director of the Center for Civic Advancement and coordinator of the event. Nettie Fowler McCormick Service Day is one of the longest-held traditions on the Tusculum campus and involves students spending time in service to others. Some of the projects that the students undertook included working with local non-profit organizations, cleaning public spaces and working with local schools. In the morning kick-off session, Dr. Gentry told the group that what they would do today would impact tens of thousands of lives. Now more informally known as Nettie Day at the university, this day of service began as a day of cleaning the campus in reflection of Nettie McCormick’s insistence on clean living environments. The day has evolved to take on a more generalized community service emphasis. This year, Nettie Day participants helped numerous organizations, including Morning Pointe and Plaza Towers assisted living facilities, Rural Resources, Andrew Johnson Cemetery, the Greeneville Theatre Guild, Tabernacle Soup Kitchen, local parks and several schools. Service activities were also conducted on the Tusculum campus. Nettie Fowler McCormick Service Day, which is conducted under the auspices of the Center for Civic Advancement, honors the memory and altruistic way of life of Nettie Fowler McCormick, widow of reaper inventor Cyrus McCormick, who was a 19th century supporter and advocate of Tusculum University. The McCormicks, staunch Presbyterians from Chicago, learned of Tusculum University through Tusculum graduates who attended their McCormick Theological Seminary in Chicago and became some of the most significant donors in the university’s history. Nettie McCormick is recognized as the university’s first benefactor, signifying that the total of her cumulative donations is over $1 million. Nettie McCormick funded construction of several of Tusculum’s historic structures, including Haynes Hall, Rankin Hall, Welty-Craig Hall, Virginia Hall and McCormick Hall, which is named after the McCormick family. For more information about Tusculum University’s civic engagement and service opportunities, contact Ronda Gentry, director of Center for Civic Advancement and Global & Mission Studies at 423.636.7300 ext. 5216 or email rgentry@tusculum.edu. President Hurley and several students help with landscaping projects at Rural Resources (pictured above left); Provost Madison Sowell encourages Tusculum University students at the start of Nettie Day, reminding them of the importance of service in being a good citizen (pictured middle); a Tusculum student helps paint during Nettie Day (pictured above right).